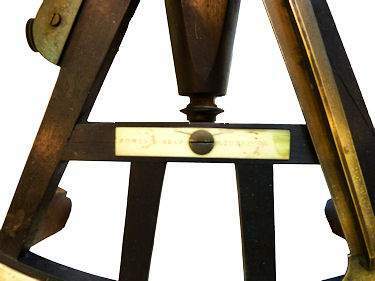 To view our current inventory of antique navigation instruments including sextants and octants, click here! Sorry there is No Case! 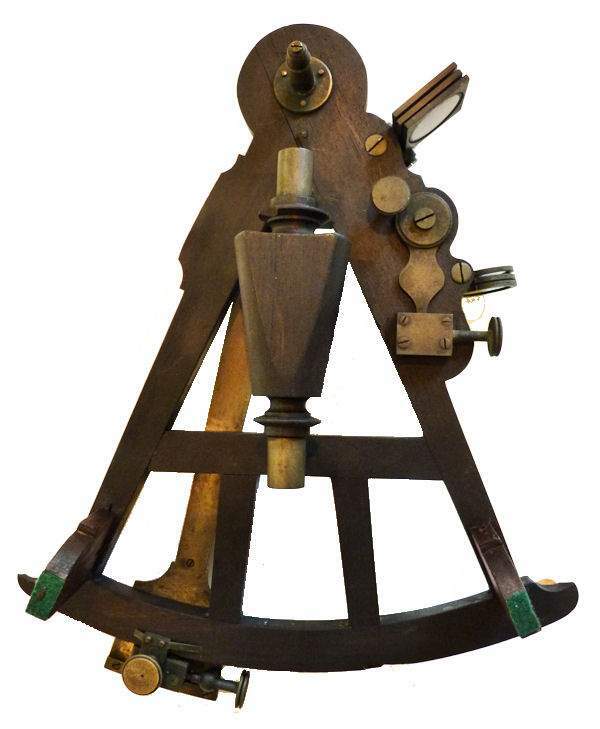 PRESENTED is an unusual and rare Jones & Gray, Liverpool 19th Century mariner's sextant with ebony frame. ivory graduated arc and vernier, and bronze fittings. The arc measures from - 5 to plus 105 degrees. 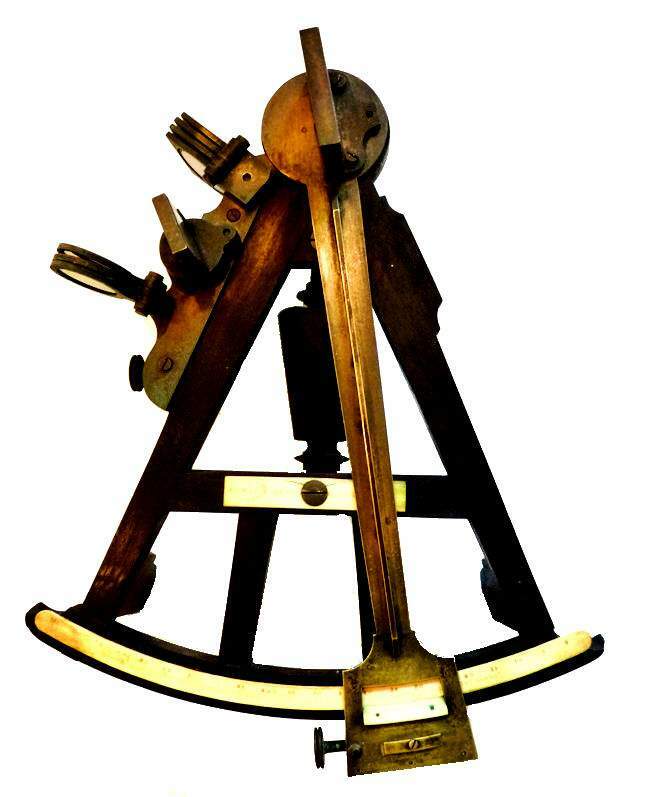 This two upright frame instrument has a brass index arm measuring 11 3/4 inches long with an early style ivory vernier scale, reading from right to left from 0 to 20 arc minutes, four sun shades, three horizon shades, an index and horizon mirror and no sighting vane or peep sight. The company is listed in Webster's Registry of Instrument Makers and “Making Scientific Instruments in the Industrial Revolution” by A. D. Morrison-Low. In 2007, a similar instrument, but with wood case was sold by Webb's Auction House of Auckland, NZ for $2196.00. 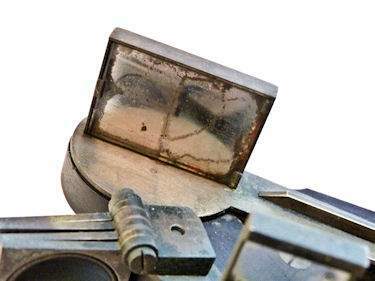 FEATURES: The frame is unusual, not only because it was never fitted with a sight, but because the terminus of the arc on either side is scalloped. And, there are two Mahogany legs fitted where you would normally find brass legs. Clearly, these are replacements. The beautifully made handle is of Ebony rather than the more commonly used Rosewood. It is possible that the frame was not drilled for a sight because that piece of Ebony might be a replacement as well, and the job was never finished. However, the frame's wood and workmanship are a match and all look like they were done by the same shop so we may never know the answer. 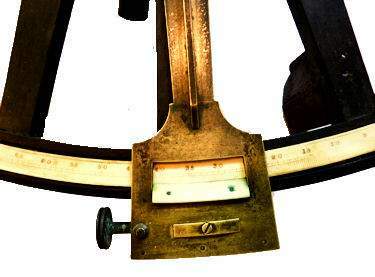 The brass machinery is of the highest quality and quite robust compared to the size of the sextant. 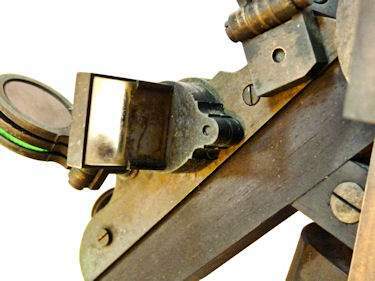 PROVENANCE: The instrument was made by Jones & Gray, Liverpool who were active under that name from 1821 - 1840 which makes our dating of Ca 1830 realistic. The book, “Making Scientific Instruments in the Industrial Revolution” by A. D. Morrison-Low who states Charles Jones and John Gray were related through marriage and that Charles was a journeyman instrument maker, while John was younger and had recently been an apprentice in the early 1800's. Their shop was located at 57 Stanley Street, East Side, Dry Dock, and 25 Strand, both of which were in Liverpool. Recent ownership was by a New England antiques dealer who doesn't recall where he got it.. CONDITION: The instrument, its ivory name, and graduated arc show wear, but are readable. The brass hardware is of high quality and in good condition except that 1/2 the spring clip is missing. It does still lock. Overall, expect some marks of age and use and some minor verdigris. Two of the legs are Mahogany replacements. The terminus of the arc on either side is scalloped. All the machinery is present and in working order except that the mirrors are degraded by age, and no sighting vane or peep was fitted. The instrument has that wonderful patina of age which ranges from light to dark green with some black overtones. There is no case. 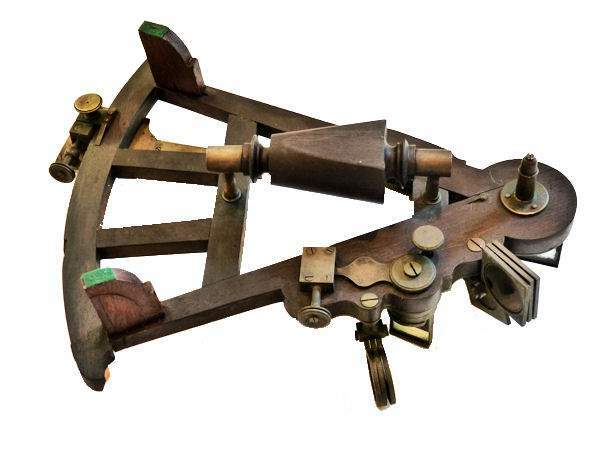 All in all, an interesting and unusual example from a pedigreed English instrument maker. Width of frame at arc 9 5/8"